Chant Shiva, Gayatri, Ganesha, Hanuman and goddess Kali’s psalm with Rudraksha garland. Chanting bij psalm with Rudraksha garland gives quick results. 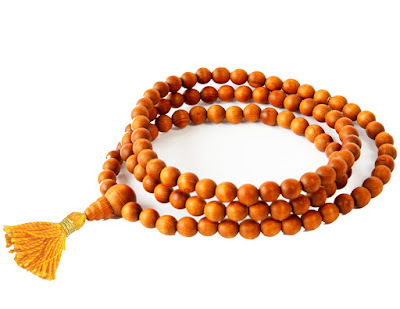 Holding Rudraksha garland in hand gives mental peace. Chant Vishnu, Lakshmi, Ram, Krishna’s all nature with Tulsi garland. Use crystal garland to chant Venus psalm, mrut Sanjivani psalm, Lakshmi pooja and Rudra anusthan. Pearl garland is used to chant psalm, which gives mental peace. It is also used to chant goddess Lakshmi, Ram and Krishna’s psalm. White sandalwood garland is used to chant Vishnu, Lakshmi, Shiva and Rahu-Ketu’s psalm. Use red sandalwood garland to chant goddess Kali, Bhairavi siddhi and Hanuman siddhi. Use turmeric garland to chant goddess Bagalamukhi and Gayatri psalm. It is also used to chant Jupiter and Pitra’s psalm. There is deep relation between 108 pearl, 108 chants, 108 positions of sadhu-sanyashi and Sun’s kala. There are 12 kala and 9 mandal of Sun. Therefore, the total would be 108. There are 12 kala in heart chakra and 9 mandal in body. There is also astrological reason behind 108 pearl of garland. According to astrology, there are 27 constellations. There are 4 charan of every constellation and total 108 charan of 27 constellations. Each pearl of garland represents each constellation. It is beneficial to sit properly while chanting psalm. It is beneficial to sit in padmashan. It is also beneficial to sit virasan, siddhasan or vajrasan. Pradosh kaal (after sunset) is auspicious time to chant psalm. It is auspicious to chant psalm in Brahm muhurt or 4-5 in morning or before sunrise. Do not changes place once you start chanting psalm. Sit on one place. Use Tulsi, Rudraksha, sandalwood or crystal garland. It should have 108 pearl.